does it work fine when you get to a toll? Yes, but u have to pay the toll, back up, and get going about 10mph to get the trailer through. Otherwise the gate will slam into the trailer. What bugs are fixed? Collision? another is not your thing. 1. route is planned for you already ok`d bye transport department. 2: you are in the company of a transport safety vehicle ahead and behind usually a toyota 4 wheel drive fitted with lights and large signs , a speed limit will be placed on the heavy load vehicle. 3. your route will take you directly to destination , usuing only roads capable of taking the load . 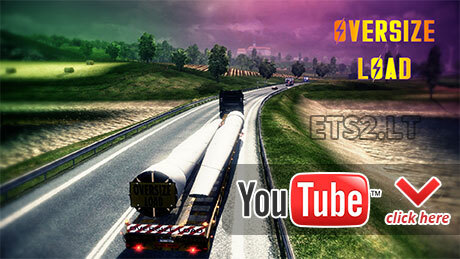 this mod is a farce , although the idea is good , traffic still don’t see past origanil trailer used . The pilot vehicles you speak of are not in the game, so someone would have to make a suitable vehicle with warning signs and flashing orange lights as well as program them to follow and lead the player’s truck. You’re welcome to try. Also these trailers replace standard trailers in game and therefore use whatever routes were already assigned to those trailers. If you use original map (or even alot of the user made maps) there will be some places where these long trailers may get stuck due to the increased turning circle of the longer length trailer. This could be minimised by having the trailer wheels turn (in real life controlled remotely by the driver of the trailing pilot vehicle). You’re welcome to try making the trailer have wheels that can turn (steer) but I dont believe it’s possible. Cool mod mate will test it, id put that other mirror up if i were u lol! If i do my turning lights on. I didn’t see it on the ground is that a mod or a uodate? Mod does not work! It just crashes the game during loading! Completely worthless! Mi van olyankor mikor a túl hosszú szállítmányt nem lehet fel venni van rola képem is de ide hova rakjam . vagy a másik felakad a hajó és a rámpa közzé és nem lehet levinni a hajóra?